Ledra studio started as a venue of artistic expression and intellectual resistance against the dictatorship during the years of the Junta (military coup in Greece in the years 1967-1974). With Costas Manioudakis as man- ager, the studio presented Nikos Xylouris, Thanos Mikroutsikos, Maria Dimitriadi, Yiannis Markopoulos and many others to the Athenian audi- ence. Since 1994 the studio was rented by the Panteion University. It is used for theatrical shows, stage reading, musical concerts, rehearsals of theatre companies and music bands, book- presentations and for artistic workshops of the BA and MA students of the Panteion University. Ledra studio is under the responsibility of the CCDS which was founded in 1992 by Minos Volanakis andYangos Andreadis and isbeing directed by the Associate Professor Yannis Skarpelos. “Classical theatre is every good theatre. Brecht, Pinter are classic like Aeschylus”. These were the words of the great director Minoas Vol- anakis when he suggested the name “Centre of Classical Drama and Show”(KEDRA) for the institution that operates at Panteion University since 1992.The stage reading “Kein” of Byron directed by Volanakis was the first event organised by the centre. The aims of the Centre were to research the roots of theatrical creation and to present either classi- cal or unpublished plays using both traditional and alternative acting methods. For this purpose it organised intercultural theatrical meetings and productions with top Indian and Cuban theatre companies (mixed workshops for greek and Indian classical drama and workshops dedi- cated to kalari –Indian version of Shaolin- and to the Cuban ritual Yo- ruba) and promoted MA and Phd researches. The main occupation of CCDS with the ancient drama is practical and creative. Since 1994 the centre presented “Bacchae, the journey of Dionysus” and “Cyclop” of Euripides in Greece, Cyprus, France, Spain and Portugal. Workshops were also conducted for “The children of An- tigone” which combined the translation of the play with a cd containing the choruses and which will be used for a new forthcoming show of the theatre piece.It is also worth noting that the centre converted a car-ferry of the military navy into a floating theatre twice (1996,1998) and present- ed ancient drama around the Mediterranean and reached as far as Lis- boa. During the last years the centre experiments in a new genre which belongs at the vanguard of the international theatre: the adaptation of ancient dramas into musicals. These experiments led to productions like “Oh my murderer” (Ach dolofone mou, 2007) and “ Burn it all” (Ola kafta) which are related to Oedipus Rex and Agamemnon of Aeschylus. All these years, Drama Centre has experimented with two kinds of per-formance: first, the classic type performances that made tours around Greece and Europe, from Thrace and Cyprus to Cadiz and Lisbon, and secondly with performances that carried the message of the tragedy through the form of political musical. In this second category belongs the political musical “Cyclops’ Survival”. It is a Brecht’s type adaptation of the Euripides’ satirical drama “Cyclops”. Its theme is about cannibalism, not just literally, but mostly in the political and social implications, as we experience it in the gloom of the current crisis. Within such logic, the ac- tors of the play are transformed sometimes into mythical creatures and sometimes in today’s sufferers and struggling people. Born in Athens, Yangos Andreadis graduated from Athens University and obtained his PhD in 1980 from École de Hautes Études Paris on Dio- nysus and madness in Sophocles’sAntigone. He teaches Creative Writing and Theatre at Panteion University of Social and Political Sciences, Ath- ens, where he also directs the M.A. program on Cultural Management. As a director of the Centre of Classical Drama of the same institution he has written, translated and directed more than ten ancient and modern plays. He has also served as president of the Artistic Committee of the National Theatre of Greece, he was elected representative of Greek Dra- ma Centre at the UNESCO (1997-2001) and inaugurated the first Chair of Greek Culture and Language in Asia, in New Delhi (2000-2001). An- dreadis has written books on ancient tragedy, Dostoyevsky, Balzac and literary theory, as well as novels, short stories and poems. His most recent works are Smugglers: Stories Taken by Others (Topos Books 2008), The Whole World is a Stage: From Aeschylus to Brecht (Topos Books 2009) and On the History of Civilization (Topos Books 2010). Nikos Athanassakis was born in Athens. He obtained a diploma in classic guitar music from the Delphi conservatory under the guidance of Ionas Melides. He also followed a three-year training by the side of renowned soloist Kostas Grigoreas and took a master class with H. Kuppel, D. Tanembaum, M.Chapdeleine, A. Holzman, D. Crimes and more. Moreover he has studied Harmony, fugue and counterpoint and synthesis by the side of prof. G. Bisbikopoulos. He actively participated in classic guitar festivals at Pilion, Ermoupolis and Corfu island, while he regularly performs in music venues and classic music halls. He has composed chamber music pieces that have been reproduced in Greece and abroad. He is also the producer of the soundtrack for the theatrical show by prof. Yangos Andreadis «I love Mnimonio», the play «With the back to rubbish» by Kimon Rigopoulos and the documentary «Baby is enough» by Alexis Ponse and Vivi Zografou (honored with the audi- ence award at Thessaloniki festival in 2011). He was born in Athens in 1945 and studied art (Ecole Nationale Supérieure des Beaux-Arts, Ecole Nationale Supérieure des Arts Ap- pliqués et des Métiers d’Art, Paris, 1976, on a scholarship, and ASFA lab. G. Morali, 1969). Since 1978 he works as a professor at the Vakalo Collage, he is teaching at the Art Workshop of Patras and he taught at the School of Photography Focus at the past. He has taken art projects for public areas (Heraklion, Rethymnon, Glyfada, Vouliagmeni, Vitina) and settled permanently sculpture of the Tomb of Marathon in 2004. At the same time with his artistic activity, he has been involved in stage design and he has designed props and masks for many theatrical per- formances. He has participated in many group exhibitions in Greece and abroad, and his art projects are being presented at the Ministry of Culture, the National Gallery in the Greek Embassy in Paris and in private collections. She was born in Athens in 1966. She studied Graphic Design (MA, 2008 BA, 1986 Vakalo), art (ASFA lab. Kessanli N., 1991, scholarship by SSF) and sculpture (Section C. Nicolaides, 1990). Since 1996, she is professor at the College Vakalo formed partnerships with the Museum of Cycladic Art in art workshops for children and she has taught at the School of Photography Focus and the Museum of Greek Children’s Art at the past. She published her book “Gods 1” (texts andgraphic design, Oxy, Athens, 1996) and since 2005 she writes, edits and illustrates the articles of art, “Researchers” of the newspaper Kathimerini. She curated the exhibition of “colorful Parnitha, like a painting” based on her idea (est. Theocharakis 2008). Participated in the Athens Xclusive Design- ers Week (2008 and 2009) as team leader of the School Student Vakalo and has designed and edited costumes for theatrical performances. In 2005 she presented a video tape about Law Kessanli in her own script and directing, in a tribute dedicated to the memory of the painter (Art act). In 2004, her three permanent sculptures erected in the square of the Cultural Park of Nea Ionia (Volos). She won the First Prize of the Museum Spyropoulos (1992) and she has participated in many group exhibitions in Greece and abroad and at the Biennale’s of Young Artists of Barcelona and Valencia. He was born in Aigio of Greece, in 1966. He graduated from the De- partment of Physical Education and Sports University of Athens, spe- cializing at traditional dances and completed a postgraduate of Carl Orff Music and Education in the «Training» and finally the State School of Dance. Participated as a dancer in several groups. Important col- laborations: participation in “Bolero” choreographed by M. Béjart at the Music Hall, the tribute to Rina Schengeld Athens College, the “Oral Treason” by Mauricio Kagel directed by S. Sakka in GNO etc. In the year 2009-2010 worked with the Athens Concert Hall, “Medea berserk” and «ATYS-LULLY» in Production: Little Opera World. He was respon- sible in kinesiology at lampadidromia of the Olympic Games which were held in Greece in 2004. He has played everywhere, everything, with everyone, in all the kinds of art for the last 42 years.He has: recorded 23 cds, wrote 3 books, created music schools, bands, groups and festivals. He taught in seminars, courses, workshops, private schools, conservatoriesand drama schools. He has socialand political activity in many places for many years. Dimitris Nakos was born in Athens in 1982. He is an doctorand in Panteion University an also a Mca graduate of Cultural Studies in Panteion University and University of Athens. He is teacher of Per- forming Arts in Panteion University Athnes. He has written, directed and produced many shortfilms and other videos. George Mwrogiannis graduated from Drama School of Michaelides in 1974. He has starred in the theater plays: “Meltemaki” (stage direction Gkonis, Theodoris A. ), “Seven logical answers” (stage direction Antonis Antypas), “Steel” (stage direction Elli Papakonstantinou), “The Bacchae” (stage direction Renate Jett), “Blood Wedding” (stage direction Gkonis, Theodoris A. ), “Cried’m alive” (stage direction Yangos Andreadis), “Back- rests inside the trash” (stage direction Kimon Rigopoulos), e.t.c. He starred in the movies: “What did you do in the war Thanasis?”, “Order”, “An old debt”, “Hades”, “The mountain front”, e.t.c. In television series: “Bow- line”, “Department morals”, “The last goodbye”, “Karyotakis”, e.t.c. Born in Athens in 1963. She studied Archaeology at Athens University and at Karolos Koun’s school of Drama. She has worked with various theatrical teams from 1983 till today. Art Theatre, Theatrical organization SKINI, EPOXI, Amore, AploTheatro, Theatre Kefallinias Street, National Theatre, Kalogeropoulou’s group, DIPETHE Patras, Lamias, Rodou and more with directors like Karolos Koun, G. Lazanis, M. Kougioumtzis, L. Vogiatzis, St. Fasoulis, B. Papavasileiou, M. Lymperopoulou, R. Pat- eraki, G. Xourvardas, A. Antypas, P. Boulgaris, M. Kakogiannis, G. Rigas, N. Milivogievits, St. Ntoufexis, N. Mastorakis, N. Xatzopoulos. She has starred in classic plays by Shakespeare, Brecht, Chekhov, Goldoni, Ma- rivo, Molière, Lorca, Fernado Rocha, Tennesie Williams, O’Neal, Bryan Friel and others. She has also starred in tragedies and ancient comedies in Epidauros (Euripidis, Sofoklis, Aristofanis). She has been nominated many times for the Kotopouli and Koun award. Kimon Rigopoulos. Studies: Aristoteleion University-Law School. The- ater at the schools of Theosiadi and Xatzikou. He has starred in plays of ancient drama, both classical and modern. He has worked with the fol- lowing directos: Volanaki, Damiano, Tsarouxi, Haralampous, Glykofrydi, Vafea, Ioannou, Diamanti, Tsiano, Tsakiri, Andreadi, Lamprouli, Vasiliki- oti, Mpaka and others. He has starred in TV series directed by: Aristopou- los, Tempos, Manousakis, Tselemengos, Markidis, Lyxnaras and others. He has starred in movies directed by Panagiotatou, Zervou and Maniati. He has written the theatre play ‘7000 words exactly’ which played at the- atre ‘Empros’ by the group Ergastirio and directed by A.Makraki, during 2004-2005. He had directed ‘Cyclops’ of Euripidi. He screenplayed and directed the play ‘Ainigmatiki Autoktonia’ of Dostoyevsky and the play ‘Moskov Selim’ of Viziinou. He also starred in ‘Taksidi stin Erimo’ 2008. In 2012 he wrote and directed the theatrical play ‘Plates mesa sta skou- pidia’ which played at Polyxwro Texnis Alexandreia. Dimitriou Euaggelia was born and raised in Limassol, Cyprus. From an early age, she engaged in music and theatre but what finally won her, was her participation in DIASTASIS cultural organization as a choir member. At the age of eleven she participated for the first time to the production “Eugenios Spatharis, the Greek” with a participation of Eugenios Spatharis himself. Her first starring theatrical role came at the age of fifteen with the musical “The title of the Show and. Other dis- agreements. “ written and directed by Costas Petrides. In Athens, she studied and graduated from the department of communication, media and culture and at the same time she collaborated with the Center for Classical Drama and Spectacle of Panteion University of Social and Po- litical Sciences. Theodora Evgenaki was born in 1984 at Larisa. She has graduated from the Drama School “ARHI” of Nelly Karra (2006) as well as from Panteion University having studied the field of Psychology. She has taken part in theatrical performances, tv series, short movies, commercial spots coop- erating with the following directors: Papadimitriou M. , Georgiadou V., Koutsiampasakos D., Hioti Ir., Marinakis V. , Papadimitropoulos Ar., a. m. She loves to express herself through singing and dancing and, last years, she develops a special contact with children by organizing groups of theater or of theatrical creativity through playing. the play “Ekklisiazouses” by Aristophanes, director Diagoras Chrono- poulos and choreographer Sophia Spyratou (Epidaurus Theatre, Greek Theatre of Art Karolos Koun, 2005). Costas Mitrakas grew up in Maurovo, Kastoria. In 2006 he graduated from the department of Communication, Media and Culture of Panteion University of Social and Political Sciences. In 2008, at the same school, he concluded his post-graduate work titled The carnival of the Macedo- nians, Creative and Ritual Therapy. Since 2010, he is working on his doc- toral thesis titled Place, Ritual, Theatrical dimensions of the Macedonian carnival under scholarship of Kaiti Kyriakopoulou since 2012. He directs the theatrical productions of the Centre of Classic Drama and Spectacle of Panteio University, in which he also stars since 2003. Was born in 18/10/90 in city of Serres. From 9 years old did trumpet les- sons from 2002 to 2008 with the Philharmonic as a member, attended con- certs in tribute to Hadjidakis, Theodorakis, Kouyoumtzis etc. In 2010 he went to George Theodosiadi’s . 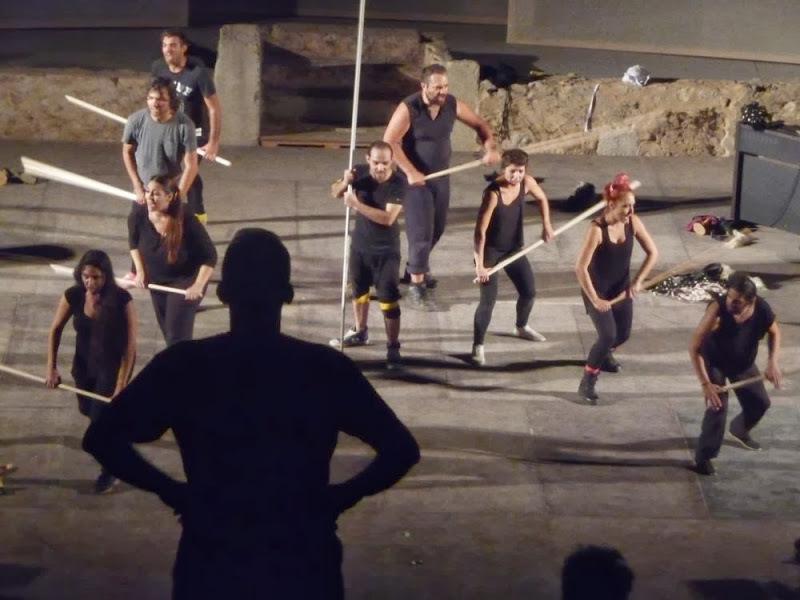 Worked in the theater play “die like coun- try,” directed by Michael Marmarinou festival of Athens (2008).Followed by performances: “Pentathlon” (text-direction)Vivian Ioannou held in ancient Olympia (2011). “The Olympic Games in the enchanted forest” directed by John Vivian theater Potamitis (2011), “Corpus Christi” direct- ed Laertes Kingdom theater Foundry (2012). “Three Sisters” by Chekhov, directed by Meritorious Tsolakidis theater ELIART (2012), “The Hunch- back of Notre Dame” directed Thanks Vorkas theater Orpheus (2012), the “Wizard of Oz” directed Thanks Vorkas theater Orpheus (2012) and “Hansel and Gretel” directed Grace Roma which toured throughout Greece (2013). In the first steps in cinema was fortunate to work with Kakias Igerinou the short film “PEELS” Helen Theodoridou and in the feature film “God Loves Caviar” directed by John emerald. in Cultural Project Management of Fondation Marcel Hicter and a BSc in Management Science and Technology of Athens University in Eco- nomics and Business. Dionysis was born in Patra city in 1992. He is a student at the Com- munication, Media and Culture Department of Panteion University of Athens. He is involved with journalism and has participated in numer- ous theatrical productions of the university’s Drama Centre.